South Korea is taking the initiative in forest welfare, with the aim of maximizing economic value of forests for the public, according to the chief of the Korea Forest Welfare Institute. 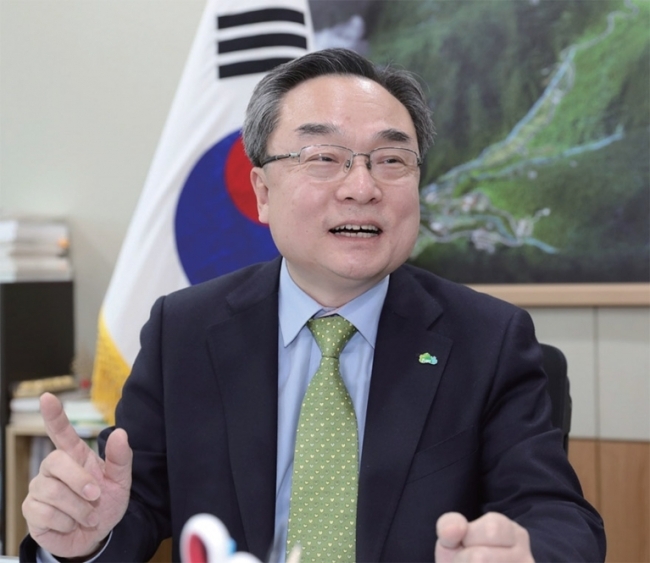 “The focus of Korea’s forests has transformed over the 40 years from simple afforestation to forest resources to sustainable forest management,” said Yoon Young-kyoon, president of the Korea Forest Welfare Institute, in an interview with The Korea Herald. “Now, the focus is on forest welfare, which means economic, social and emotional support to the public using forests, with the aim of improving the public welfare,” said Yoon who has been working in the forest industry for around 40 years. He is the first leader of the Korea Forest Welfare Institute set up in April 2016 under the Korea Forest Service. The government agency is aimed at providing forest welfare services, a term coined by Korea. “Forest welfare services that started with forest lodges in the 1980s are now expanding into forest education, forest healing, forest culture and forest ‘leports’ (leisure and sports),” Yoon said. Forest education helps people to experience the diverse functions of forests and understand their importance. The institute plans to open forest education centers in Daejeon city, Chungcheong province and Naju city, South Jeolla Province. Forest healing uses diverse elements of forests, such as the scent and scenery, to improve people’s immunity and health. The government agency currently runs “healing forests” and is raising related professionals. Yoon said the agency is also working to highlight benefits of the forests that could help people maintain a healthy and satisfied lifestyle from birth to death. In terms of prenatal education, forests could help pregnant women’s emotional stability. Children can also improve their physical and emotional development through forest experiences. Youths can enjoy mountain leports, such as climbing, mountain biking and alpine skiing. Meanwhile, mid-aged people and their families can enjoy such recreational activities as camping and tracking. Forests could also help seniors reduce their stress. Lastly, forests could also provide sites for natural burials. “This forest welfare for the entire life cycle helps the public to enjoy opportunities given by nature, both physically and emotionally,” the chief of the agency said. The Korea Forest Welfare Institute is also working in line with the Moon Jae-in administration’s “people-oriented economic policies” that prioritize the creation of quality jobs. “We have mapped out a five-year plan for creating 5,000 quality jobs by opening new experiences and education centers by 2022,” he said. The agency plans to open forest experience centers in Daejeon in 2019 and in Chuncheon and Naju in 2020. It also plans to open a forest welfare education center in 2021.